Build 1 - Starter Items Notes This start provides tons of power and sustain, making you a big threat to the enemy early on, as your Swarm will hit hard. However you don't have any mobility, so play cautiously and watch out for ganks. Also Mage's Blessing passive procs on Bees! for even more power, making your early game even stronger. Build 1 (see notes for boots replacement) Notes This build was sourced from Kriega1, who made it in the comment section of 'S5 AMC Build' by DiabolicNutria. I've tried and tested it with great success, credit to Kriega1! When you've finished the build sell Warrior Tabi for Titan's Bane, (or any other situationals), and buy the Elixir of Speed to make up for the lost MS. Build 2 - Starter Items Notes This start gives you some much needed power, sustain and a little bit of MS. Pair this with Hive at level 2, and you're able to outmanoeuvre enemies in the early game, vastly helping poke damage and escaping ganks. Also Mage's Blessing passive procs on Bees! for even more power, making your early game incredibly strong. Silverbranch Bow but bear with me please, I'll explain later in the Items section of the guide how this certain build works and how to use it. for Bloodforge and buy the Elixir of Speed to make up for the lost MS. Build 3 - Starter Items Notes This start gives you a decent amount of power and lots of sustain due to Spiked Gauntlet, this will ensure you'll stay in lane longer for extra farm. Also Mage's Blessing passive procs on Bees! for even more power, making your early game incredibly strong. Build 3 (see notes for boots replacement) Notes This build was sourced from Branmuffin17, who made it in the comment section of this guide. This is definitely an interesting build for Ah Muzen Cab, allowing you to utilise your AA's more, credit to Branmuffin17! When you've finished the build sell Warrior Tabi for Poisoned Star and buy the Elixir of Speed to make up for the lost MS.
Situationals Notes Magi's Cloak provides a small amount of protections and surviveability with its passive. Buy this if the enemy team has lots of CC. Brawler's Beat Stick is a fantastic anti heal item that can apply to lots of enemies at one time. Buy this if the enemy team has healing. Titan's Bane is the best choice for anti tank due to its passive. Buy this if the enemy team has more than one tank. Devourer's Gauntlet provides good amounts of lifesteal and physical power. Buy this if you're going AA heavy. Relics Notes Purification Beads is a must as Ah Muzen Cab has no escape, therefore they'll help you out of stuns, slows etc and let you loose the enemy. Aegis Amulet helps when having trouble with boxers like Mercury, after activation throw up a Hive for the MS and run way. Heavenly Wings can be a life saver as the MS helps Ah Muzen Cab out of tricky situations. Also you can use this aggressively when its upgraded, as your AA will grant you haste. Phantom Veil is essential when facing Odin as it helps you escape his Ring of Spears; this is necessary as you're very squishy and most likely won't survive if you stay inside the Ring of Spears. Hello fellow smite players, this is a guide for Ah Muzen Cab. I'm in no way a smite veteran or a veteran at playing Ah Muzen Cab. However I saw he is quite outdated and needed some love. Therefore I took it upon myself to create a guide for him and for players to understand his role/playstyle/builds etc. and also any future feedback I receive, from other smitefire users, to help make this guide the best it can be. Below are the other sections to this guide. Now lets dive into the hive mind of Ah Muzen Cab! This section will go through the purchase order of Build 1 and I'll explain briefly what the items do and how they fit into the build. This item list will go in the order of the purchase order shown at the beginning of the guide. Warrior Tabi helps you drastically, as it provides lots of physical power helping you with waveclear, poke, ganks etc. Also the extra MS paired with Hive makes you able to rotate indefinitely, and gank the enemy to kingdom come. Transcendence is great for early power and CDR in order to consistently use poke damage and waveclear. Additionally this item helps Ah Muzen Cab resolve one of his greatest weaknesses.....mana costs. Transcendence resolves this with added mana, MP5 and a fantastic passive. PASSIVE - You gain 15 Mana per stack, and you gain 5 stacks for a god kill and 1 stack for a minion kill (max. 50 stacks). In addition, 3% of your Mana is converted to Physical Power. The Crusher is possibly the most core item on Ah Muzen Cab, as its passive perfectly synergises with his passive Bees!. Not to mention its added AS, physical power and penetration. The Crusher is a must buy on any Ah Muzen Cab build. The Executioner is a core item on any hunter, as its passive its able to shred physical protections off gods, allowing AA's to punish bruisers like Hercules and tanks like Geb. Additionally, The Executioner paired with The Crusher allows Ah Muzen Cab to deal huge damage with his AA's due to the added physical penetration from The Crusher. PASSIVE - Basic attacks against an enemy reduce the target's Physical Protection by 12% for 3s (max 3 stacks). Qin's Sais is another core item as it helps your AA damage adapt to a gods health. Furthermore, its passive allows you to punish bruisers like Hercules and tanks like Geb that build high HP items such as the Stone of Gaia. This item paired with The Crusher and The Executioner allows Ah Muzen Cab to consistently damage gods with his AA's. Bloodforge gives Ah Muzen Cab sustain in his kit,(unless you consider the healing from Hive sustain), which allows him to stay in teamfights longer. Also Bloodforge passive lets Ah Muzen Cab gain some surviveability once he kills an enemy god, preventing him from being singled out too easily. This section will go through the purchase order of Build 2 and I'll explain briefly what the items do and how they fit into the build. IMPORTANT NOTE: it is STRONGLY recommended you play under the influence of Hive, as the added 40% attack speed benefits the passive of Silverbranch Bow massively, making the build the most powerful it can be so your AA's hit hard. Warrior Tabi helps you drastically, as it provides lots of physical power helping you with waveclear, poke, ganks etc. Also the extra MS paired with Hive makes you able to rotate indefinitely, and gank the enemy to kingdom come. The reason why I didn't use Ninja Tabi in this build, (because the AS benefits the passive of Silverbranch Bow), is because overall Warrior Tabi offers more power, making it the better item. The Crusher is possibly the most core item on Ah Muzen Cab, as its passive perfectly synergises with his passive Bees!. Not to mention its added AS, physical power and penetration. The Crusher is a must buy on any Ah Muzen Cab build. Also the added AS benefits the passive of Silverbranch Bow. The Executioner is a core item on any hunter, as its passive its able to shred physical protections off gods allowing AA's to punish bruisers like Hercules and tanks like Geb. Additionally, The Executioner paired with The Crusher allows Ah Muzen Cab to deal huge damage with his AA's due to the added physical penetration from The Crusher. Also the added AS benefits the passive of Silverbranch Bow. Qin's Sais is another core item as it helps your AA damage adapt to a gods health. Furthermore, its passive allows you to punish bruisers like Hercules and tanks like Geb that build high HP items such as the Stone of Gaia. This item paired with The Crusher and The Executioner allows Ah Muzen Cab to consistently damage gods with his AA's. Also the added AS benefits the passive of Silverbranch Bow. Odysseus' Bow this item ensures it's possible to overcap AS, therefore the passive of Silverbranch Bow is utilised. Not to mention the passive of Odysseus' Bow helps waveclear and teamfights, also the added AS means more procs of The Executioner and Qin's Sais. PASSIVE - Every fourth Basic Attack triggers a chain lightning, damaging the target and up to 4 nearby enemies for 30 damage +60% of your total Physical Power. This section will go through the purchase order of Build 3 and I'll explain briefly what the items do and how they fit into the build. Devourer's Gauntlet is great for early power and lifesteal as its passive makes Ah Muzen Cab stronger the more you stack it, giving you a good power curve in the early game. Moreover, its lifesteal allows him to stay in lane longer, as you don't have to return to base as often after taking damage. Wind Demon gives Ah Muzen Cab alot of aggression in his kit due to its passive. The passive gives him extra AS and MS every time he scores a critical hit, which allows him to chase down enemy gods as they run away so you can kill them before they escape. However don't play too aggressively as Ah Muzen Cab has no escape, only take advantage of the passive when you're in a group so you don't get singled out. PASSIVE – Your Critical Hits increase your Attack Speed and Movement Speed by 20% for 5s. Deathbringer is a must buy for any crit build due to its passive making, Ah Muzen Cab deal a ridiculous 523 crit damage. Because of this absurd damage you can 3/4 shot most squishes such as Ra or Loki. Pair this with Hive, for the AS, so you can crit more consistently and Deathbringer makes you a force to be reckoned with. Bees! is an interesting passive and a quite powerful one too because it acts as an inbuilt The Crusher. It can be considered even better than The Crusher due to basic attacks extending the duration of Bees!, therefore theoretically you could make the duration last indefinitely and play a war of attrition with enemy Gods. Furthermore Mage's Blessing passive procs on Bees! adding even more damage to this already insane passive, (this is why you use it as a starter item). Bees! procs on Swarm // Honey (under the influence of Hive) // Stinger so make sure to utilise these abilities whenever you can to maximise your damage output. synergises well with Hive as it procs Bees! making this combo a great harassment tool, just remember to use it inside the radius of Hive otherwise it won't proc Bees! Swarm is Ah Muzen Cab main clear and damage source. In the early game this ability does a lot of damage, not to mention that it procs Bees! and Mage's Blessing for even more damage making his clear one shot minion waves early on in the game. Hitting this ability on Gods that are moving can be quite hard however because it moves slower than standard wave clears such as Spirit Arrow, so I suggest pre-aiming this ability when dealing with enemy Gods. Honey seems like a simple ability in concept, however it can be used in a variety of situations. Mostly you would want to utilise it for its 20% slow, for gank setup or to chase down enemy Gods to finish them off. Honey can be used defensively as well when paired with Hive as you can close off a section of a lane or jungle to protect yourself and/or teammates because the damage and slow provided will be difficult for enemies to overcome. I wouldn't recommend carelessly using this ability as Ah Muzen Cab has no escape, so always save it for chasing down enemy Gods or slowing down a ganking jungler so you can escape. Stinger is a really fun ultimate due to its CDR feature where if you pick it up after firing, you gain an 80% CDR reduction to this ability, which makes it possible to use it every 18 seconds. You should be using this ability to finish off enemy Gods as if it hits an enemy God whilst they're still alive the Stinger stays in them for 4 seconds until falling out. This could lead you into a false sense of security to picking it up causing you die, so I recommend not chasing Gods for your Stinger unless you're confident you won't be trapped and killed. This section will go through the damage output of Ah Muzen Cab, which will include stats from all three of the builds featured in this guide. All testing was done on Odin bots in jungle practice with 5 AA's fired on them prior to testing (to remove protections). This section will go through the Early Game, Mid Game and Late Game for Ah Muzen Cab as well as a few tips to help you gain advantages in your game. You don't have to follow this section word for word, but its a general guideline for how you should be playing Ah Muzen Cab. The early game is quite strong for Ah Muzen Cab as his Swarm does really high amounts of damage, allowing him to clear quickly and either go for purple buff or raid the enemies purple buff. As well as this when Ah Muzen Cab gets his Hive at level 2, he is able to outmanoeuvre most Gods that early in the game, making him hard to hit for the enemy ADC. 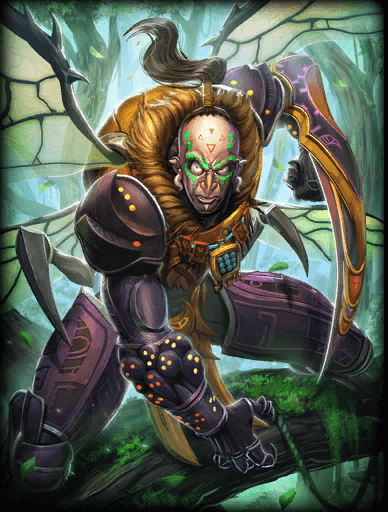 Hive provides attack speed and a small amount of healing as well which gives him some sustain and DPS, making his early game quite powerful. Keep in mind Ah Muzen Cab has no escape and is very squishy, so don't get too cocky and watch out for ganks. PRO TIP: place a Hive directly behind your tower so that enemy Gods can't hit it, (the radius will be big enough for you to receive the benefits from it as well). Also the radius of the Hive reaches out a few tiles infront of your tower so you can hit the enemy Gods outside of your towers radius with Honey and it will proc Bees! this a great harassment tool and remember to place a Hive near your purple buff to watch out for ganks. In the mid game if you have chosen Build 1 Transcendence should be at max stacks, along side with Warrior Tabi and The Crusher. This deadly trio provides Ah Muzen Cab with high damage potential because his abilities will proc The Crusher and situationally Bees! as well. This is great for wave clear and harassment, making the enemy gods extremely cautious of you. The mana from Transcendence will allow you to constantly use your abilities and the CDR will shave a second or two of your abilities which helps. If you chose Build 2 you would've just bought The Executioner, making Ah Muzen Cab very powerful as he can consistently proc it's passive shredding protections. Pair this with Hive,(which should be level 2 or 3 by this point), and you hit hard during the mid game. You should constantly apply pressure in the duo lane due to this power spike, but not too aggressively as remember Ah Muzen Cab has no escape. If you chose Build 3 you would've just bought The Executioner, making Ah Muzen Cab very powerful as he can consistently proc it's passive shredding protections. Moreover, Devourer's Gauntlet should be fully stacked by now, meaning you have tons of sustain so you farm longer in lane, helping you get the sufficient gold you need for this expensive build. Regardless of your build, at this point you should be going for the gold fury, so you can secure a gold advantage for your team. You should place a few Hive around the gold fury as well, so you can see if an enemy is trying to steal it or gank you when you leave the area. If you're feeling confident gank the middle lane and steal their red buff, but don't do this too often as you will loose wave pressure. If you chose Build 1 you will deal tons of ability damage, just keep using this combo: Hive // Honey // Swarm then if you have it Stinger. This combo will maximise damage potential as you will proc the crusher on each ability and Bees! as well. In between each ability use an AA to proc The Executioner to remove protections in order to deal additional damage with each ability. If you chose Build 2 you should follow the above steps however, since your abilities don't hit as hard, utilise your AA's more. This helps a ton in teamfights because you're able to proc Odysseus' Bow which when enemy Gods bunch up maximises your damage potential. REMEMBER with Build 2 you should ALWAYS be under the influence of Hive. This is so the passive of Silverbranch Bow is used effectively, allowing you to reach your maximum damage output. If you chose Build 3 you should prioritise your AA's over abilities because your abilities deal the least amount of damage compared to the other builds: this doesn't mean you should fully nullify them though. Moreover by now you should have all your crit items online, resulting in you having a 60% crit chance. Your AA's will hit for a massive 523 crit damage, pair this with items such as Wind Demon and Poisoned Star that let you stick to enemy gods, and this makes you a force to be reckoned with. To maximise your damage output, play under the influence of Hive so you get more AS, enhancing your DPS. Regardless of your build, during teamfights you need to play very cautiously as Ah Muzen Cab is very squishy. Therefore you would preferably want to play behind your tank harassing the enemy team, whilst utilising your abilities in the combo shown above. You should only play aggressively with Ah Muzen Cab when the enemy is on run or trying to return to base. In this scenario keep using Honey to slow the enemy down and if you have it, use Heavenly Wings as it grants extra movement speed and haste to your AA's when upgraded. You can also use Honey to setup ganks as well, which is useful for singling out a lone enemy God. Furthermore, at this point you should going for the fire giant at every opportunity you can so you can receive his buff, making you even stronger and giving you an edge over the enemy. Like with the gold fury place a few Hive around the fire giant, so you can see if an enemy is trying to steal it or gank you when you leave the area. Finally, if you have enough gold buy a Potion of Physical Might and a Elixir of Power for a massive damage boost however if the enemy team is playing really aggressive and has lots of burst Gods like Fenrir or Bakasura, you might want to consider Elixir of Defense instead, so you have some surviveability against them. Thank you for reading through my Ah Muzen Cab guide, I hope this helps in any way as mentioned earlier I'm in no way a smite veteran or a veteran at playing Ah Muzen Cab, so take everything with a pinch of salt, this is my first guide after all! I'll update this as frequently as I can, when relevant information arrives. Credit to Kreiga1 for Build 1; Branmuffin17 for Build 3 and Nanoyam for making this comprehensive God builder guide .... https://www.smitefire.com/smite/guide/a-guide-to-creating-a-guide-11941 .... without it my guide would've looked like ***. "One other thing I'm sort of interested in seeing is a crit/Qin's build for late-game. With an item slot opened up, could be nice. It would be along the lines of Devo's or BF + Exe + Qin's + PS or Rage + WD + DB (not in that order of course). But it would have to be really, really late game." Is this assumption correct? Because if so, I need to clarify the build direction a bit better, and maybe suggest a couple build directions. Note that I had said "not in that order of course." It's important to understand build progression, and looking to optimize it as much as possible. Right now, you have the build as Warrior Tabi, Devourer's Gauntlet, The Executioner, Qin's Sais, Rage, Wind Demon, then sell boots and get Deathbringer + Elixir of Speed. That isn't necessarily bad, but also not optimal IMO. Option 1: Same up to Qin's Sais...but after that, in order to get MORE out of Qin's, I'd probably suggest Wind Demon due to the really nice AS boost, then Deathbringer (DB almost always as 2nd crit item), then sell Boots for Poisoned Star. Option 2: Slight deviation, bypassing a late Poisoned Star, and instead get The Crusher or Silverbranch Bow after Devo's...will give better support to Qin's at the point you get Qin's online. Would look like: Warrior, Devo's, Crusher or Silver, Exe, Qin's, WD, sell boots get DB. Option 2 (Crit v1 using Rage for high crit %): Crit route first, then add Qin's late. Warrior, Devo's, Exe, Rage, DB, WD, sell Boots and get Qin's (or get Qin's, then sell Boots and get WD...Qin's first if facing a lot of high health enemies). Option 3 (Crit v2): More standard/popular crit route, though PS nerf sorta hurts. Warrior, Devo's, PS, Exe, DB, WD, sell boots for Qin's. Finish up your crit before getting Qin's to make it as reliable as possible. Qin's is just a nice bonus DPS boost. Thanks for the feedback Bran, sorry btw for the very late reply I had some personal issues over the weekend, but I'm back to update the guide. From the crit builds you've presented ,which I thank you for, I'm going to pick option 1 just because of the really nice PO and usefulness due to Wind Demon's and Poisoned Star's passive (the combination seems disgusting). Compared with the other options, I prefer this PO the most and I'll be updating the guide based upon it tomorrow afternoon, just before the guide contest ends. 140232 UPLAR Thanks for the feedback Bran, sorry btw for the very late reply I had some personal issues over the weekend, but I'm back to update the guide. From the crit builds you've presented ,which I thank you for, I'm going to pick option 1 just because of the really nice PO and usefulness due to [[wind demon]]'s and [[poisoned star]]'s passive (the combination seems disgusting). Compared with the other options, I prefer this PO the most and I'll be updating the guide based upon it tomorrow afternoon, just before the guide contest ends. Cool beans, no problem on being late, it's your guide after all. Hope whatever you were dealing with is worked out. 140235 Branmuffin17 Cool beans, no problem on being late, it's your guide after all. Hope whatever you were dealing with is worked out. Seems very solid overall. Kriega and Bran already said everything so just read their comments. 136521 xmysterionz Seems very solid overall. Kriega and Bran already said everything so just read their comments. Congrats to your first guide, I hope you make others ;) +1. Thanks mate that means alot! I'll be definitely improving the guide, based upon their feedback. 136530 UPLAR Thanks mate that means alot! I'll be definitely improving the guide, based upon their feedback. Start is fine, but an alternative is: Mage's Blessing, Morningstar, health and mana/multi pots, and would give you a stronger laning phase early game. Mage's blessing is better than Hunter's Blessing on AMC, especially since the not too distant change to it where it has physical power, and because the passive of mage's blessing also procs on AMC's passive. Also, another thing to realise is due to AMC's lack of a proper escape, getting Trans before boots on him is quite risky. I would probably get boots first if you get Mage's Blessing which is the safer route. Start 2: Change to Mage's Blessing, Mace, pots. Build 2: Not a very good build, my adjustments: Warrior Tabi, The Crusher, The Executioner, Qin's Sais, Titan's Bane, Odysseus' Bow or Bloodforge. Lastly, I would get Honey at level 3 not level 4. 136513 Kriega1 Start is fine, but an alternative is: [[Mage's Blessing]], [[Morningstar]], health and mana/multi pots, and would give you a stronger laning phase early game. Mage's blessing is better than Hunter's Blessing on AMC, especially since the not too distant change to it where it has physical power, and because the passive of mage's blessing also procs on AMC's passive. Build 1 is fine of course. But Bloodforge and the other items can be replaced. Bloodforge can be swapped for Qins, Odysseus' Bow, qins can be swapped for beatstick etc... Look at the top 4 builds from here (well the lower 3 of the top 4): https://smiteprobuilds.com/Builds?p_filters_page=1&p_filters_search=&p_filters_god=1956&p_filters_pro=~&p_filters_opponent=~&p_filters_role=~&p_filters_league=SPL&p_filters_sort=~ Also, another thing to realise is due to AMC's lack of a proper escape, getting Trans before boots on him is quite risky. I would probably get boots first if you get [[Mage's Blessing]] which is the safer route. Start 2: Change to [[Mage's Blessing]], [[Mace]], pots. Build 2: Not a very good build, my adjustments: [[Warrior Tabi]], [[The Crusher]], [[The Executioner]], [[Qin's Sais]], [[Titan's Bane]], [[Odysseus' Bow]] or [[Bloodforge]]. Lastly, I would get [[Honey]] at level 3 not level 4. I still kept my Silverbranch Bow build though as I've improved it's PO (as suggested by Bran) so its power curve is better, making it more viable. However I've added everything else you suggested. 136658 UPLAR Updated! I still kept my [[silverbranch bow]] build though as I've improved it's PO (as suggested by Bran) so its power curve is better, making it more viable. However I've added everything else you suggested. Ahhh, good point on Mage's Blessing, and on the safety of getting boots before Trans. I know you're not a fan of Silver...my comments were based on an acceptance that UPLAR liked Silver. It's not something I'd typically get, but I can see the function. 136540 Branmuffin17 Ahhh, good point on [[Mage's Blessing]], and on the safety of getting boots before Trans. I know you're not a fan of Silver...my comments were based on an acceptance that UPLAR liked Silver. It's not something I'd typically get, but I can see the function. Hey Kriega, thanks for the feedback. I'll be sure to include all the recommendations you gave where appropriate. I'll be combining all the advice from you and Bran to make this guide even better. I'll start to update this tomorrow. 136538 UPLAR Hey Kriega, thanks for the feedback. I'll be sure to include all the recommendations you gave where appropriate. I'll be combining all the advice from you and Bran to make this guide even better. I'll start to update this tomorrow. Nice job on your first guide! It looks solid, visually, and it's organized well. Nano made a great guide that's pretty timeless. Build 1 looks fine. I have no complaints about the items chosen, or the order purchased, as a general example build. As you note that the build is directly taken from Kriega, I would suggest confirming with him before taking the build, though. You do give credit, though, which is good. Build 2 with the Boots start might be a bit inefficient, gold-value-wise, but I can understand the purpose for mobility as you describe. And since he has very little mobility, that might help a bit. But in that case, I know you're looking to build into Tabi and Crusher ASAP, but you might want to consider Hunter's Blessing instead of Mace...with no Trans, you'll be slightly starved for mana in longer lane stays, and the MP5, while minor, will be helpful. The attack speed will also be helpful since you're getting Warrior Tabi and your AS will be low until you get Crusher and higher levels in Hive. The full build example also looks fine overall. I don't know what your AS will be at full build, but if you are in fact overcapping, then Silver makes sense and can be helpful. It's also getting a decent buff for S6, along with crits probably being a bit weaker. Qin's is a great way to go overall. I do wonder if you might want lifesteal in some form, though. I'm not sure if O-Bow at this point of the build is best. It's not bad, but my preference would be AFTER Qin's Sais. The lack of power in the item hurts your power curve at that point, and the high AS won't be fully helpful until you have Qin's, which is the key item in the entire build for DPS. Example full builds are great, but one thing you're perhaps missing is a secondary listing of items that might be purchased situationally, depending on the match and the enemy comp. Magi's Cloak for survivability, Brawler's Beat Stick for very, very easily applied anti-heal to lots of enemies at one time, Titan's Bane as full anti-tank function, and you might also want some lifesteal. Soul Eater could potentially work, and Devourer's Gauntlet is always a solid lifesteal item for basic attackers. You don't have to list all of these, like if you don't prefer Devo's...but some of these are key situational items. Your skill leveling looks fine. In a case where you're facing an Odin, you might consider Phantom Veil as a situational relic. Heavenly Wings can also be nice in upgraded form for the Fatalis (haste) effect, along with added MS since he doesn't have a good escape (and as backup in case his hives are taken down). S6 is a couple weeks away or so. This will open up the possibility for Tabi replacement late-game with Elixir of Speed. Once it does hit, you will want to consider adding those extra item options for the late Tabi replacement. In your build writeup for build 2, you mention choosing Warrior Tabi over Ninja Tabi just for the higher power, "making it the better item." You're probably right in most cases, especially as you prioritize The Crusher early. But note that the higher early AS not only benefits a late Silverbranch Bow, but also Qin's Sais that you build before it, as more hits = more passive damage procs. And then you don't have to worry as much about overcapping AS when you're adding Silver into your build. But...yeah...Warrior in the very early game is going to offer the better DPS, and a bit more oomph on your wave-clear Swarm due to 80% power scaling. If anything, I'd get Qin's, then O-Bow, then Silver (or situational). Or maybe it should be Silver then O-Bow (not sure what your AS will be at that point with full rank Hive. In your early game writeup, you mention going for purple + harpies or raid the enemy's purple. I don't think you'll typically want to go all the way to the harpies (back harpies, I assume?). Mostly leave that for your Jungler to farm, and if anything, look to secure the oracles or help secure the red buff when you have the opportunity. You talk late game about good points overall, but (and it might be obvious) the emphasis should be not to just go for Fire Giant, but more importantly, to stick with teammates. That's the biggest and most important thing for AMC, IMO. 136498 Branmuffin17 Hi UPLAR, Nice job on your first guide! It looks solid, visually, and it's organized well. Nano made a great guide that's pretty timeless. On to the build. [list][*]Build 1 looks fine. I have no complaints about the items chosen, or the order purchased, as a general example build. As you note that the build is directly taken from Kriega, I would suggest confirming with him before taking the build, though. You do give credit, though, which is good. [*]Build 2 with the [[Boots]] start might be a bit inefficient, gold-value-wise, but I can understand the purpose for mobility as you describe. And since he has very little mobility, that might help a bit. But in that case, I know you're looking to build into Tabi and Crusher ASAP, but you might want to consider [[Hunter's Blessing]] instead of [[Mace]]...with no Trans, you'll be slightly starved for mana in longer lane stays, and the MP5, while minor, will be helpful. The attack speed will also be helpful since you're getting [[Warrior Tabi]] and your AS will be low until you get Crusher and higher levels in [[Hive]]. The full build example also looks fine overall. I don't know what your AS will be at full build, but if you are in fact overcapping, then Silver makes sense and can be helpful. It's also getting a decent buff for S6, along with crits probably being a bit weaker. Qin's is a great way to go overall. I do wonder if you might want lifesteal in some form, though. I'm not sure if O-Bow at this point of the build is best. It's not bad, but my preference would be AFTER [[Qin's Sais]]. The lack of power in the item hurts your power curve at that point, and the high AS won't be fully helpful until you have Qin's, which is the key item in the entire build for DPS. [*]Example full builds are great, but one thing you're perhaps missing is a secondary listing of items that might be purchased situationally, depending on the match and the enemy comp. [[Magi's Cloak]] for survivability, [[Brawler's Beat Stick]] for very, very easily applied anti-heal to lots of enemies at one time, [[Titan's Bane]] as full anti-tank function, and you might also want some lifesteal. [[Soul Eater]] could potentially work, and [[Devourer's Gauntlet]] is always a solid lifesteal item for basic attackers. You don't [i]have[/i] to list all of these, like if you don't prefer Devo's...but some of these are key situational items. [*]Your skill leveling looks fine. [*]In a case where you're facing an [[Odin]], you might consider [[Phantom Veil]] as a situational relic. [[Heavenly Wings]] can also be nice in upgraded form for the Fatalis (haste) effect, along with added MS since he doesn't have a good escape (and as backup in case his hives are taken down). [*]S6 is a couple weeks away or so. This will open up the possibility for Tabi replacement late-game with [[Elixir of Speed]]. Once it does hit, you will want to consider adding those extra item options for the late Tabi replacement. [*]In your build writeup for build 2, you mention choosing [[Warrior Tabi]] over [[Ninja Tabi]] just for the higher power, "making it the better item." You're probably right in most cases, especially as you prioritize [[The Crusher]] early. But note that the higher early AS not only benefits a late [[Silverbranch Bow]], but also [[Qin's Sais]] that you build before it, as more hits = more passive damage procs. And then you don't have to worry as much about overcapping AS when you're adding Silver into your build. But...yeah...Warrior in the very early game is going to offer the better DPS, and a bit more oomph on your wave-clear [[Swarm]] due to 80% power scaling. If anything, I'd get Qin's, then O-Bow, then Silver (or situational). Or maybe it should be Silver then O-Bow (not sure what your AS will be at that point with full rank [[Hive]]. [*]In your early game writeup, you mention going for purple + harpies or raid the enemy's purple. I don't think you'll typically want to go all the way to the harpies (back harpies, I assume?). Mostly leave that for your Jungler to farm, and if anything, look to secure the oracles or help secure the red buff when you have the opportunity. [*]You talk late game about good points overall, but (and it might be obvious) the emphasis should be not to just go for Fire Giant, but more importantly, to stick with teammates. That's the biggest and most important thing for AMC, IMO. [/list] Thoughts? My reasoning for picking warror tabi over Ninja Tabi is because although yes Ninja Tabi benefits the passive of Silverbranch Bow, you actually gain more power with Warrior Tabi. Here is some evidence: Build 2's power with Warrior Tabi (while being level 20 and under the influence of Hive) is 263. However, Build 2's power (same conditions) with Ninja Tabi is 253 so theirs a 10 power difference there, not a major increase but its still 'better'. Build 2 (while being level 20 and under the influence of Hive) is 21 = 21 power. This is why i emphasise you ALWAYS play under the influence of Hive. Through some testing I've found the most optical PO is Warrior Tabi // The Crusher // the executioner // [[qin's sais // Silverbranch Bow // Odysseus' Bow // (with hunters blessing being sold late game for Odysseus' Bow. I agree that buying Qin's Sais helps your power curve, so I'll put that in before Odysseus' Bow. Through testing I've found if you get Odysseus' Bow before Silverbranch Bow, you actually overcap attack speed, (under the influence of Hive), without any benefit from Silverbranch Bow passive or base power stats. Therefore buying Silverbranch Bow first is better as you overcap your attack speed, (under the influence of Hive), and gain 2 stacks. Then you buy Odysseus' Bow, getting you the total of 21 stacks. 136533 UPLAR Hey Bran, sorry for the late update I'm English so GMT and PST don't mix well, ah well regardless of that, thanks for you feedback! I'll definitely update the guide based upon it. However their are some points I want to clarify: My reasoning for picking [[warror tabi]] over [[ninja tabi]] is because although yes [[ninja tabi]] benefits the passive of [[silverbranch bow]], you actually gain more power with [[warrior tabi]]. Here is some evidence: Build 2's power with [[warrior tabi]] (while being level 20 and under the influence of [[hive]]) is 263. However, Build 2's power (same conditions) with [[ninja tabi]] is 253 so theirs a 10 power difference there, not a major increase but its still 'better'. Also some stats about the amount of stacks of [[silverbranch bow]] you get: Build 2 (while being level 20 and under the influence of [[hive]]) is 21 = 21 power. Build 2 (while being level 20 and NO [[hive]]) is 2 = 2 power This is why i emphasise you ALWAYS play under the influence of [[hive]]. Through some testing I've found the most optical PO is [[warrior tabi]] // [[the crusher]] // [[the executioner // [[qin's sais]] // [[silverbranch bow]] // [[Odysseus' Bow]] // (with [[hunters blessing]] being sold late game for [[Odysseus' Bow]]. I agree that buying [[qin's sais]] helps your power curve, so I'll put that in before [[Odysseus' Bow]]. Through testing I've found if you get [[Odysseus' Bow]] before [[silverbranch bow]], you actually overcap attack speed, (under the influence of [[hive]]), without any benefit from [[silverbranch bow]] passive or base power stats. Therefore buying [[silverbranch bow]] first is better as you overcap your attack speed, (under the influence of [[hive]]), and gain 2 stacks. Then you buy [[Odysseus' Bow]], getting you the total of 21 stacks. So in the end, I was just sort of pointing out that Warrior isn't necessarily just straight better. It's better earlier, and maybe Ninja is a bit better late, at least S5. But with S6's eradication of late boots, we don't even have to worry about that. Just plan for early game efficiency. If you go a different route and don't get Silver / AS, you'll probably cap under Hive, but it does give you other options for items. Question ends up being...is Silverbranch Bow truly worth it? And that one is up in the air for me. The passive power when overcapped is nice, but what it's doing is giving you a tradeoff...hey, your build is inefficient because you blew past the AS, so you know what? I'll give you some extra power as a freebie. That tradeoff is questionable, and probably not optimal. What Silver DOES do for you is put you right at the cap when you don't have a Hive up. And depending on how well the enemy takes down your hives, or their retreat or yours moving you outside Hive range, that keeps your DPS potential basically at full...and that's worth something. In terms of other items that provide AS, Atalanta's Bow will have the same power in S6 as Silver, and will give you some MS, which is nice, but doesn't have any pen. Asi has no power (but does have lifesteal which you're missing in your 2nd build). I see it as an optional item that can be just fine, but isn't core. I hear you on the purchase order...I hadn't calculated that out, and I'll take your word for it with those item options. Overall, make no mistake, Qin's isn't just for power curve. It really is the centerpiece of the entire build. Where you get your biggest average DPS spike in a crit build when you have your 2nd crit item online, your biggest leap in a non-crit build is going to be when you build Qin's. One other thing I'm sort of interested in seeing is a crit/Qin's build for late-game. With an item slot opened up, could be nice. It would be along the lines of Devo's or BF + Exe + Qin's + PS or Rage + WD + DB (not in that order of course). But it would have to be really, really late game. 136539 Branmuffin17 Hey UPLAR, My discussion on Warrior vs. Ninja was just based on how everything read, not that I disagreed with the item choice. To clarify, early-game, Warrior tends to be better, not just for ability scaling, but also just DPS as a whole. But as you build power with other items and delve into Qin's, the AS ends up being a bigger help. I covered this in detail in this post: https://www.smitefire.com/smite/forum/theory-crafting/adc-theory-crafting-balancing-power-amp-attack-speed-58650 So in the end, I was just sort of pointing out that Warrior isn't [i]necessarily[/i] just straight better. It's better earlier, and maybe Ninja is a bit better late, at least S5. But with S6's eradication of late boots, we don't even have to worry about that. Just plan for early game efficiency. Okay, so you're saying with a full build, Silver is putting your attack speed at 2.92 (technically)? If that's true, then we look at the final functional stats... [list][*]Under the influence of [[Hive]]: 2.5 (capped) AS, 41 power (51 in S6), 10 flat pen [*]No [[Hive]]: Allows you to be at 2.5 AS with just a bit extra, 22 power (32 in S6), 10 flat pen[/list] If you go a different route and don't get Silver / AS, you'll probably cap under [[Hive]], but it does give you other options for items. Question ends up being...is [[Silverbranch Bow]] truly worth it? And that one is up in the air for me. The passive power when overcapped is nice, but what it's doing is giving you a tradeoff...hey, your build is inefficient because you blew past the AS, so you know what? I'll give you some extra power as a freebie. That tradeoff is questionable, and probably not optimal. BUT... What Silver DOES do for you is put you right at the cap when you don't have a Hive up. And depending on how well the enemy takes down your hives, or their retreat or yours moving you outside Hive range, that keeps your DPS potential basically at full...and that's worth something. In terms of other items that provide AS, [[Atalanta's Bow]] will have the same power in S6 as Silver, and will give you some MS, which is nice, but doesn't have any pen. [[Asi]] has no power (but does have lifesteal which you're missing in your 2nd build). I see it as an optional item that can be just fine, but isn't core. I hear you on the purchase order...I hadn't calculated that out, and I'll take your word for it with those item options. Overall, make no mistake, Qin's isn't just for power curve. It really is the centerpiece of the entire build. Where you get your biggest average DPS spike in a crit build when you have your 2nd crit item online, your biggest leap in a non-crit build is going to be when you build Qin's. One other thing I'm sort of interested in seeing is a crit/Qin's build for late-game. With an item slot opened up, could be nice. It would be along the lines of Devo's or BF + Exe + Qin's + PS or Rage + WD + DB (not in that order of course). But it would have to be really, really late game. Hey Bran, thanks for your research into Silverbranch Bow. About the boots situation, in S6 I'll most likely sell Warrior Tabi for Bloodforge as yes, Build 2 needs some sustain. During this weekend I'll be adding all the necessary feedback I've received from you and Kriega. This will include: item changes; a Build 3 (crit build made by you);adding a 'situationals' section and improving the 'gameplay' section with your feedback. I can't wait to see what this guide becomes and I appreciate your feedback. Now it's time to go to bed lol, (I'll start working on it tomorrow). 136546 UPLAR Hey Bran, thanks for your research into [[silverbranch bow]]. About the boots situation, in S6 I'll most likely sell [[warrior tabi]] for [[bloodforge]] as yes, Build 2 needs some sustain. During this weekend I'll be adding all the necessary feedback I've received from you and Kriega. This will include: item changes; a Build 3 (crit build made by you);adding a 'situationals' section and improving the 'gameplay' section with your feedback. I can't wait to see what this guide becomes and I appreciate your feedback. Now it's time to go to bed lol, (I'll start working on it tomorrow). Always get Warrior Tabi on AMC. 136545 Kriega1 Always get Warrior Tabi on AMC.